Friends, I am terribly sorry about the length of time between posts in this series “Authentic Fellowship” series. We’ve only gotten through 3 messages, and we have 4 left. I mentioned in my last message that I had recently become a new father, and that I was having to work really hard at learning how to balance ministry, working at Krispy Kreme, family, and even find some time to tend to myself. So, it’s been nearly a month since my last message, and I am sincerely sorry. It’s a new day, however, and I have a feeling that we’re going to at the very least get through message number four today, and maybe a message or two over then next few days. At the end of this message I’m going to invite you to friend my personal Facebook account and “like” my ministry Facebook account because I have begun posting devotional messages on both of them, and I’d like for you to be able to read them as well. I have been instructed to leave them on my Facebook accounts, and so that’s what I’m going to do. So, let’s get back into this series on Authentic Fellowship, and see how far we get today. Again, I am sorry for taking so long to get back to this series, but I have my reasons…and I promise to work to get this series finished so we can move on. Fellowship requires honesty. When there is pretense there can be no genuine fellowship. John begins his first letter with such a good picture of this truth about the nature of fellowship. People who can’t or won’t be honest with each other are people who will never experience the kind of nurturing fellowship God desires among His people. Perhaps one of the most important things about what we’re talking about is taking a moment to talk about what authentic means. Part of being authentic is honesty, integrity, and sincerity. In order for us to have “authentic fellowship” our love for people must be genuine and honest. Think about it. We know when someone is being fake don’t we? I know I can. I can tell a difference when someone truly and genuinely cares about me, and when someone just cares about what I can give or do for them. I know when someone truly wants me in their life, and when someone just wants me around for something that suits their needs. I can also tell you that I am more likely to fellowship with people who really care about me and want me around than those who pretend to like me. So, let’s bring that to the truth about what’s going on in the church. In the last message I said that I have had an easier time making friends with people who genuinely care about me when I was hanging out in the bars than I do with people who are in the church. That’s changed since coming to the church that I attend now, but my point in bringing that up is once again this: It should never be easier to find something in the world than it should be to find it in the church…and specifically it should never be easier to find genuine love and fellowship with the world than it is to find in the church. Friends, the world should never…ever be able to nurture what the Body of Christ is responsible for. We are responsible for loving one another. We are told that the world would know God’s disciples by the love they have for one another, and to take that further…their neighbors, their enemies…basically the love we share is the thing that identifies us as God’s disciples. The Bible doesn’t say that the world would be the ones identified by love…it said that God’s people would be. I keep saying that if the world can find true, authentic, genuine fellowship with people in the world, and they can’t find that in the church…where they are supposed to be able to find it…why would they want to join our churches, why would they want to become Christians, and why would they want anything to do with a God who has His people treating people worse than the world does. Yeah. I went there, and I’m not sorry. We in the Body of Christ treat people in the world and in our own church worse than the world does. Why in the world would anyone be attracted to the church if it treats people worse than the church does when the church is supposed to be the entity that stands out from the world? If the church looks just like or is worse than the world…what is there to attract the world to? Jesus was always approachable, and while He may not have approved of what the people who approached Him did…He still loved them and desired to fellowship with them. Come on, people, we have a whole song by Casting Crowns that talks about how Jesus is a “friend of sinners”. He ate with the sinners, He fellowships with the people who weren’t the religious folk of His time, and we somehow think that if we hang out with those types of people today that we’re going to get worldly cooties and that we’re going to wind up being more influenced by the world than the world is influenced by us. Good grief. If Jesus hung out with the people of and in the world, and wasn’t wasn’t worried about catching their leprosy…why are we so worried about it? I will tell you why…we have no desire to truly have the heart of God because if we did…we would look at the world that is lost, dying, and headed straight to hell a lot differently than we do. How in the world to we as a church think we have the right to judge people when God said for us to love them? If God told us to love them…that’s what we’re supposed to do. God was very clear that we’re not to judge people, but love them. God was very clear that we’re to work out our own salvation…but we are so busy pointing out the specks of sin in everyone else’s lives while we walk about with big old logs of sin in our own. Oh, God, who are we to be so prideful and disobedient? How dare you judge the specks of sin in someone else’s lives. Who are you to do God’s job? You think that just because I call you out on being judgmental I want to be able to live my life however I want. No…I will trust the Holy Ghost to tell me what He wants me to do and not do. I will allow the Holy Ghost to be the One who tells me what He wants to remove from my life, and what isn’t a big deal to Him. That’s the job of the Holy Ghost…NOT YOURS. I have found more acceptance in the world than I have in the church. I have had more people in the church thumb their nose at me because I’m divorced and remarried. God was the One that lead me through my life. How dare you judge the path I was called to walk down just because it’s not the path you walk or because you don’t understand why God asked me to walk the road I have. I should never be able to find more acceptance and understanding from the world than I should be able to find within the Body of Christ. Yet, time and time again I find people IN the world that are completely accepting of who I am, and the church time and time again thumbs their noses at me…and tells me that I’m not worthy of their God…who are you to tell me that? Maybe you should hit your knees and repent for being so judgmental over the lives of others instead of being the one to scold me for my life? We talk about how if we walk in fellowship with people in the dark that we will somehow become people of the dark too. Is your faith that weak that you’re afraid to go into all the world and do what God told us to do? If you’re afraid to step outside the walls of your church…then stay in them…and stop judging those who are doing The Great Commission. Yeah…I went there too. If you’re afraid to do the great commission…stop judging the people who aren’t. If you don’t understand how God is using people…don’t judge the person or the method…instead be thankful that there are people who aren’t afraid to walk in the darkness to get people out of it…and pray for them. Pray for the laborers who aren’t afraid of the dark. The wolf has millions of wolves in sheep’s clothing, and I for one am one of the many that are called to be a sheep in wolves clothing. I know many of you religiously pious folks have no idea what that means or why I’m called to be that…but I do…and therefore I’m not going to worry about what you think…because it’s not what you commissioned me to do…God did. As long as I am doing what God has called me to do…who are you to judge it just because you don’t understand the method? I have gotten away from the purpose of this message, but that side journey was necessary because it has a lot to do with this “honesty and fellowship” business we’re talking about. If it’s easier to find that in the world than it is to find in the church…then the church is wrong and needs to repent because it should never…ever be easier to find in the world what God says should be found in the church. And just calling it fellowship doesn’t make it so. We mock God’s character and power if we claim to be intimate with Him but our lives are a mess. When God’s around, the lights are on! 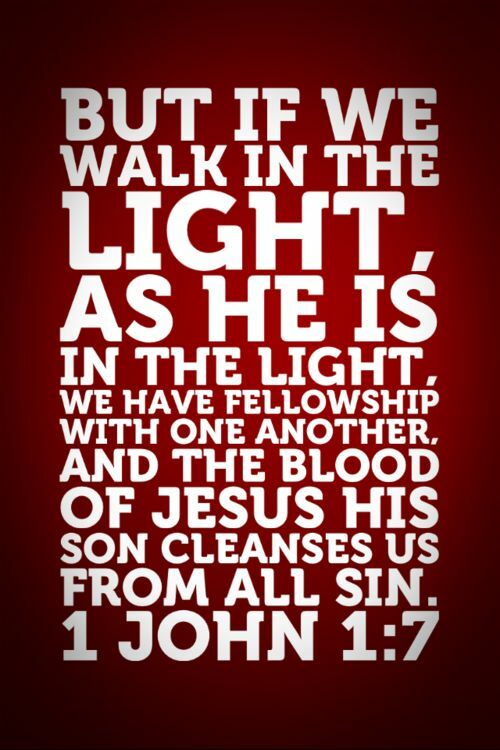 Walking in the darkness means we may bump into each other, but we won’t have fellowship. Here’s the problem with this idea. I have the light of Christ inside of me, and I also have a mandate from God to go into the darkness and pull people out. I can’t do that if I’m afraid of the dark. In fact, I remember God saying to me clearly that if I’m going to get into fear…to not go into the dark. You see, perfect love casts out fear, and that for me includes the fear of the dark. In addition, I understand that not everyone is called to go into the dark, but that goes back to what I was saying a minute ago. If you don’t understand the calling don’t be so easy to judge what you don’t understand, and pass it off as something God wouldn’t ask someone to do. Tell that to Phillip as he was telepathically sent from one place to another long before anyone knew that could happen. I’m pretty sure no one in the book of Acts knew anything at all about the possibility of being instantly transformed from one place to another…but that’s what God did. So, just because you may not understand what someone is called to do doesn’t give you the right to judge it. As a matter of fact, people like me need an enormous amount of prayer because we’re called to go into the places the church is afraid to go…because of the fear of being influenced by the darkness. Anyways, none of that is relevant to this series or this message, but I guess the Holy Ghost felt it necessary to allow me to take that side journey. Here’s the point of what Dr. MacDonald is saying here…we have to make sure our lives aren’t a mess, and I don’t know about anyone else…but for me…that’s a full-time job. So, I don’t have time, the ability, or the right to judge another persons walk, and I know that it’s not my job to do so anyways. By the way, I am not in any way suggesting that we scrap the idea of not yoking ourselves with unbelievers. I said that I’m called to go into the dark places to pull people out…I’m not called to hang out in the dark places. There’s a difference in being in the dark places for a purpose, and just being in them to be there. That is something that can only be done because and by the grace of God…and certainly only by someone God has called to do that. Let me be perfectly clear…when I understood what God was calling me to do…I was tempted to get into a little bit of fear. Not just because of the calling, but because much of the religious world would not only not understand it, but would be the primary place my persecution would come from. I have talked about this before in how God used a friend of mine to speak some things to me about this that really comforted me and gave me the confidence I needed, and the confirmation that what I was hearing in my spirit really was from Him. Anyways, on with the series, and hopefully I’m finished with this side journey. When we see ourselves and one another clearly under God’s clarifying and purifying light, we are in position to appreciate each other, observe the cleansing work Jesus performs in one another’s lives, and experience the common ground that creates fellowship. So, now we get back to what I was talking about with the championship sports teams…back to the common ground…the common goal. Did you know that the Bible lays out a common goal for Christians fellowshipping with other Christians…the Bible calls it “iron sharpening iron”. In other words, we need each other. We need to learn from one another, encourage one another, pray for one another, and when we worship God together…that’s when two or three witnesses are gathered together…and Jesus shows up…and lives are transformed and changed and we encounter Jesus…but all that requires a common goal of believers fellowshipping with believers. The church can do so much more with a like-minded group of sold out and on fire people for God than He can through a whole bunch of individuals people. In other words…we’re back to unity and fellowship being not just a good idea, but something that is absolutely necessary…and a requirement. John is clearly pointing to the heart of authenticity in these verses. Authenticity requires honesty—not putting on a mask; not coming to church and acting okay when I’m not. It is weeping with those who weep; rejoicing with those who rejoice; bearing one another’s burdens, and so fulfilling the law of Christ. God forbid our churches would ever become a place of pretense and mask-wearing and acting like I’m fine when I’m not. And now we are back to the heart and motives and being genuine. In order to be authentic you must be absolutely genuine and there has to be a real integrity or honesty as to who you are. It’s like I said way back at the beginning of this message…we all know phony people when we meet them. Go to a photography studio once. You can tell the people who have a real, genuine smile, and those who are forcing it and faking a smile for the camera…which smiles make the better pictures? The ones that are genuine or the ones that are phony? It’s the same thing with us. If our love for people is genuine…people are going to know it. If our love for people is fake and forced…people are going to know that. The most important thing to understand here is that people are drawn to those who are authentic. Look at Jesus’ ministry. Read Matthew, Mark, Luke, and John…read about the people who interacted with Jesus, who were drawn to Him, and the children who were always drawn to Him. Can I tell you this? You can tell a lot about how authentic a person is by whether or not animals and children generally like to be around them. Animals and children are outstanding barometers when it comes to being able to detect a persons authentic character. Let me ask you. Are you the kind of person that anyone is randomly attracting people or are you the kind of person that repulses most people? Are you the kind of person that sinners and the least of people are drawn to…or you the kind of person that when folk see you coming down the street they cross over to the other side? Can you honestly say that you’re willing and able to be found “weeping with those who weep; rejoicing with those who rejoice; bearing one another’s burdens, and so fulfilling the law of Christ.”? And with that question I am going to close. In the introduction I mentioned that on my personal and ministry Facebook accounts I have begun writing devotionals. They’re not quite daily because I tend to not really write them on the days I work, but if you’re interested in those or if you would just like to connect with me via Facebook, and yes I would love to connect with you on Facebook if you’re not already following or a friend of mine. See, that’s what authentic fellowship is about. I desire to interact with and connect with those who are following along. I want to fellowship and interact with you…but that has to be a two-way street. So, if you’d like to follow my Christlike Ministries NWA Facebook Fan Page all those letters in blue are a direct link to it. Just click on the link, hit the “like” button, and you’ll receive our postings in your News Feed. If you’d like to be my friend on my personal Facebook account click this link (the blue letters) Pastor Bryan’s Personal Facebook…and then click to add me as a friend, and I promise I will accept…and you’ll get the devotionals I write there as well. If you are on Twitter, and you’d like to connect with my there. My Twitter handle is @ChristMinistNWA. If this ministry is a blessing to you…won’t you take a moment to connect with me and let me know? Send me an email at christlikeministriesarkansas@yahoo.com or leave a comment here. I would love to hear from you. Let me know where you’re reading these messages, if they help or encourage or inspire or challenge you. I would really like to connect with as many of you as possible…and do my part in being the kind of friend that y’all would like to fellowship with. Thanks again for your patience. I truly am sorry for the length of time in between messages, and I promise to get back to being more consistent with writing these messages.